This research analyzes the experience of a community art collective of young artists in Liberia, Costa Rica. The discussion presented, locates this group as an actor that seeks to address the enjoyment and practice of art as a public good in a context where the social hegemonic order promotes it only as a good for private exchange. 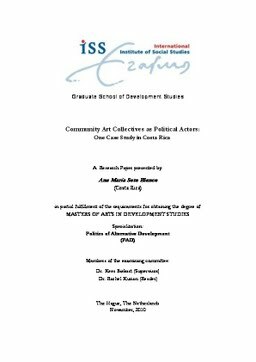 In this sense the aim is to recognize the political character, the group, by emphasizing its agentic capacity to propose and ad-dress social change through community art practices. The study uses a qualitative approach and discusses concepts of power, collective agency and the public space as one full of inequalities, conflicts, and hegemonic structures. -- Relevance to Development Studies -- This research is located within development studies because is concerned about power dynamics and social change. However it is not a state-centred or market-centred analysis. It is focus on people´s experiences in their everyday life social interactions with different power structures. In this sense, the document aims to contribute to development studies from a qualitative approach to a particular case study, but drawing its connections within a historical-contextual moment and broader dynamics of power.